This is third part of WordPress tutorial for beginners. In this article we will discuss about WordPress Dashboard. 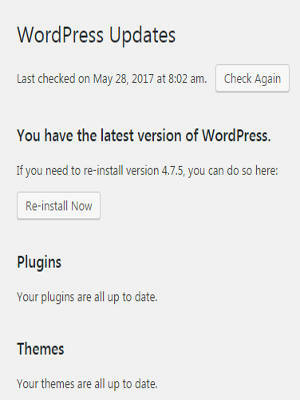 Dashboard is the page you saw after installing WordPress in second part of this tutorial. In case you missed second part of this tutorial then you can read at below link. Dashboard is back end part of WordPress. A website has two parts. This page is front part of my website. Any page you see online is the front part of website. I have written this article. To write this article I have to access back end. The back end is secured. Note after installation in second lesson you logged in to see the backend. You have to use backend to make changes to your website. The backend of WordPress is called Dashboard. It is divided into multiple sections based on functionality. We will discuss each part in details. All the details shown on this page can be accessed in detail with different menu options. We will explore those options later in the tutorial. This page shows statistics of your website in short. It is very important to keep your installation up to date. This is one of the important security measure. Old version of WordPress may be prone to attack. By using latest version you are minimizing chances of attacker to use those vulnerabilities. Also new updates will have new features.This page also shows if your plugins or themes are up to date. We will discuss themes and plugins later in this tutorial. But you should ensure all these are up to date. Ideally your update menu page should be as shown in below image. Probably this is most frequently used menu options of Dashboard. It helps you add , delete , change a post. But before diving into menu options let’s understand what a post is? Sitemap ( We will discuss it in detail in other chapters). You should use post to share your thoughts on a topic , share images and videos. Visitors can then comment on your post. This adds interactivity to your posts. In next lesson we will discuss about creating a new post and page. 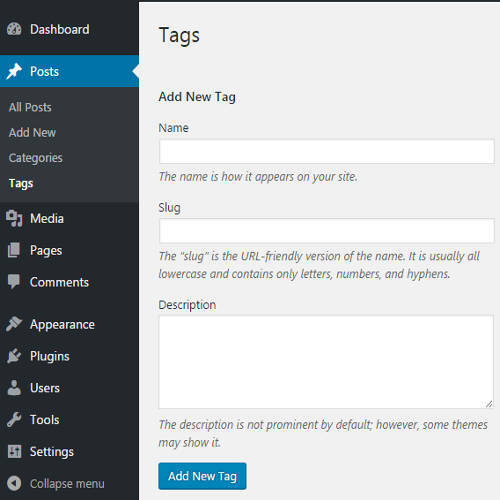 WordPress Dashboard has separate menu options for Posts and Pages. From above example you might have spotted difference between them. But lets discuss the difference in details. Pages are important content of you Website. For example if you want to one article about yourself on your website then you should use Page. As you are not writing about a topic. You are writing about yourself the owner of the website. It is an important article. You will not write multiple articles about you. There will be only one article (should be only one). As in case of books you have only one preface page and Author page. These type of important content should be part of page not post. On the other hand posts are group of articles you want to write on a topic. For example if you want to write about your Hobbies then you can write series of articles on it. Those articles inviting visitor’s thought about your hobbies should be written as posts. What are Category and Tags? As mentioned above categories and tags are used to group similar posts or posts on similar topics. For example lets assume you want to write about Festivals of World. Then festivals of World can be your category. You can write series of articles on different festivals in World. Now there are hundreds if not thousands of festivals in World. You can club all your articles in one category. But if you want to have finer division.. Lets say you want all Christmas articles in group and Diwali articles in other group.In that case you can create two tags Diwali and Christmas. You can use these two tags to club articles on Christmas and Diwali in one place. Above I have given vast example just to illustrate the concept of Category and Tags. In reality you should create category if you have more than 20 articles on one topic. You should create tags to further sub group these articles. You can have 5 to 10 articles in each tag. It is very important to decide Categories of your blog before writing. It helps you to fix topics you will be writing about. The main topics of your websites should be your categories. The tags are further sub division of categories. Also while determining categories you should try to come up with sub topics within that categories. Those sub topics will form tags.If your categories grow like number of articles if that sub category grows you can have tags to further sub group the articles. It is better to create an excel sheet with list of categories and tags with in those categories. The excel sheet will remind you of topics you should cover on this blog. You should not divert too much from main topic of blog initially. Determination of main topic of blog is also termed as Niche. Instead of having General topic blogs where you write about everything under sun it is better to have blogs concentrating on a particular topic. Your visitors can relate to your blog. How to create a Category? In this lesson we will see how to create Category and Tags. We will discuss post and page creation in next chapter. Post creation is more detailed so left for the next lesson. Go to the sub option Categories under the Posts menu from your WordPress dashboard as shown in below image. Parent – You can create category inside other category. But I recommend you should not. Hierarchical categories is not good idea. So always keep it as None. But if you want to create a category inside other then you can select that category name from the drop down. Description – Here you can write short description about your category. After making above changes click on Add New Category button to create a category. In step 2 we have successfully created a category. On the same page you will see your new category. There will be a default category present names Uncategorized. If you do not assign a category to a post then that post is clubbed under this default category. The name , slug and description fields of Tags and Category have meaning . Once you click on Add New Tag button a new tag is created. Should I use Category, Tags or both? This is very common confusion. Categories and Tags are way to organize your content for Visitors. You should not use same category or tag for two different content topics. If you want to use only categories to organize your content then you can. You can also use only tags to organize your content. But as mentioned above if your category grows then you can sub group them with Tags. For example f you have 100 post in a category then it is better to create 10 tags with 10 post each. It will help visitors find your content easily. 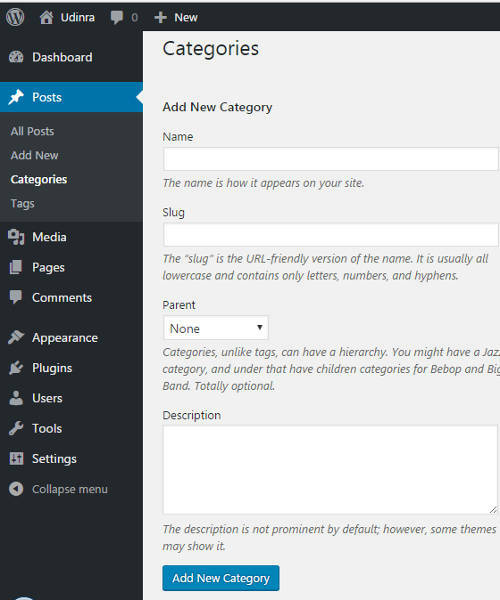 Later in the tutorial we will see how this combination of Category and Tags will help us in creating menu of our blog. There is nothing wrong in using only category or tags or combination of both. Many ask this question in relation to SEO but it does not matter. You should ask your question What way will help you organize your content better? The resulting answer will help you decide which way to go. We will now move to next lesson. In that lesson we will see how to create posts.